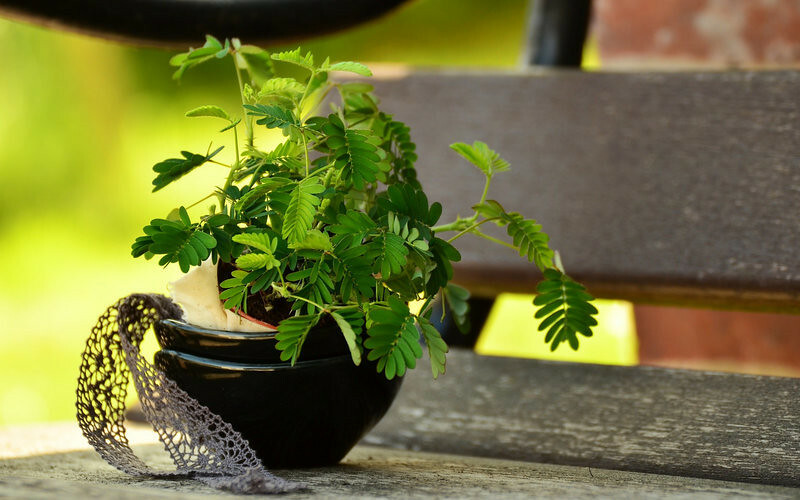 Mimosa pudica is also known as “touch me not plants” or “sensitive plant.” It is so called because the plant responds when exposed to touch with, its leaves go falter with sink and after some time it re-opens. It reacts when the force is applied in a plant knowing or unknowingly, it is sensitive to animals, to light at the time of day, daily dew, insect contact, etc. Mimosa pudica name derives from the two Latin words “Mimosa” for “mimic” means to the sensitivity of the leaves and “Pudica” means “shy” shying away or shrinking These plants are native to South America and Central America. Why do touch me not plant leaves droops when touch? There are several theories given behind the sensation of touch me not plant. It is believed that the potassium drifts from the motor neuron to the intercellular spaces after a stimulant of Mimosa. The researchers suggested that potassium may be an osmotic agent who may be responsible for the decreased turgor pressure causing seismonastic in Pulvinar during the reaction. It was also found that the outflow of the potassium in pulvinar in Mimosa cell’s increases substantially during seismonastic response thereby increasing potassium levels in the external solution and decrease in potential was also discovered. Overview: Mimosa pudica is a short-lived shrub that usually grows to 50-70 cm tall (about 1 m ) and when supported it possibly will rise more than 2m stretching straight. It is a sprawling thorny sub-shrub with branches having scattered stings about 2-2.5 mm long or is occasionally whiskered or sometimes almost hairless. Leaves: The leaves are alternative bipinnate they do not have prickled and are very reactive to touch. The axis of the compound leaf are 1.5 to 5.5 cm long, and the pinnae (primary partitions of the compound leaf) are sub digitate (almost finger-like ledges). There are 10-26 pairs of leaflets (the shortest sections through the leaf) per pinna, are 6-15 x 1.2-3 mm and linear-oblong. Flowers: The flowers are lilac-colored or pinkish ball-shaped heads and are held in oval-shaped tailed heads of 1-1.3 x 0.6-1 cm. A cluster of 1 to 5 flower heads is born in the leaflet axil. The calyx is minute, about 0.2 mm long. The corolla is 2-2.3 mm long and consists of four stamens. Blossoming occurs from August to October in Indian condition. Fruits: It has bunched of 2-8 pods that are around 1.8 cm x 3-5 mm, densely thorny flocked and have prickled along their edges. Roots: Characteristics 6-8 layer of covering cells. The secondary cerebral cortex consists of thin-walled parenchyma packed with granules. The cells of cortex contain both tannic acid and calcium oxalate crystals. According to Ayurveda text, it has properties such as pungent, cooling, vulnerary, alexipharmic and its root is bitter in taste. It has been narrated as “sparshaat sankochataam yaati punashcha prasruta bhavet” that means a plant which overlap itself when touched and expands its leaves once again after a while. All five parts of plants such as roots, stem, leaves, flowers, and fruits are used as folk medicines for health care. Mimosa pudica or so-called “touch me not plant” is a subdivision of about 400 types of herbs and shrubs in the Mimosoideae subfamily of the legume family Fabaceae. Among all, about 8 species are found in India, which has therapeutic value and others are used as ornamental in traditional festivals. In Ayurveda, it is used as antiasthmatic, stimulant, pain-killing and antidepressant remedy. The whole plant is crushed and used for itchiness and itch-related diseases. Its roots are used for leucoderma, angiopathy, neuropathy, ulcers, dysentery, swellings, jaundice, bronchial asthma, smallpox, strangury, fevers. Its leaves are used for hydrocele, hemorrhoids, fistulous withers, scrofula, pinkeye, cuts and bleeds. The whole plant is used for vesical calculi, for dropsy, rheumatoid arthritis, myodynia, and uterine tumors. It is used for itching and other skin infection, its juice is boiled with 1/4 of gingely oil and prepared oil is externally applied over the affected area. The leaves are boiled in water and given for the pain in hip and pain over the kidney area. For bronchial asthma in children dose about 10ml of the juice of samoolam of this plant is given daily once for 2-3 days. The plant leaves are used for diabetes; the juice of this plant is given to the dose of 25-30ml in the early morning. The leaves and the roots are dried and powdered and given to the prescribing of 2-5 grams for diabetes. Philippines: Its roots are used as diuretic, dysentery, and dysmenorrhea. China: Is used as the remedy for anxiety and depression. India: It Is used for birth control; its juice is used externally to fistulous sores, for diabetes, swellings. Guiana, Antiles & La Reunion: Its roots are used for nauseant. Indo-China: Its seeds are used as the emetic. Mexico: It is used to soothe depression. Mimosa pudica perennial has been used as a remedy for bleeding piles for many years. It is a well-known antidote. It is very easy to use at just crush the leaves into a fine paste and applied like a plaster which will calm burning and bleeding. It works as a good remedy because of its amazing wound healing properties. It is an important herbal medication for ulcers; a study on Mimosa pudica’s impact on ulcers was promising. The research in rats with artificially induced ulcers indicated that a 1mg dose of ethanol extracts had very efficiently reduced the ulcers. The leaves of Mimosa Pudica were traditionally used for treating wounds. The extract was made by grinding the leaves with little water and extract juice was used on the wounds. The study was performed with both the methanolic and the total aqueous extract was used in 3 different concentrations (0.5%, 1%, and 2%) in ointment base basic. The results were astonishing, the ointment containing 2% of both the methanolic and the total aqueous extract showed significant wound healing activity. Note: The researchers believe that methanolic extract exhibited good wound healing activity with Mimosa pudica probably due to phenols constituents. Uses of Mimosa pudica for the healing of diarrhea has been used as the traditional remedy. The study in albino rats was carried out by inducement diarrhea using castor oil and was treated with ethanol extract; it was founded to be very effective in curbing diarrhea. An important and curious study was performed on the effect of mimosa pudica on the poisonous activity against the Indian snake cobra venom. The study was conducted through the water, extract of the dried root of mimosa pudica (by boiling a dried root in water) it was found to be very pleasant at repressive the activity of snake venom. Note: More study is essential for this remedy, but it can be used as first aid in advance while consulting the doctors. Mimosa pudica herbs have been used as traditional medicine for anti-inflammatory in various parts throughout the world. In the research done, it was found that the plant has flavonoids and phenolics, and other secondary metabolites with a variety of biological properties. These properties were noted to be helpful in the prevention of aging, cardiovascular disease, and effectively discarded waste oxygen free radicals. Note: The latest study say that the whole plant, stems, leaves, and seeds of M. pudica Linn have strong antioxidant activity and leaf extract have the strongest properties and stem extracts the least. Mimosa pudica herbs as used as remedy for the diabetic in many parts of India. The research conducted using the Ethanolic and Petroleum ether with leaves and root the result was positive and found to be helpful to lower levels of blood sugar. Note: In the research ethanolic and petroleum ether extract of Mimosa pudica Linn was used and was compared with Metformin as a standard drug (500mg/kg). The rats were treated with Alloxan (150mg/kg) to induce diabetes. Two methods were used to determine the plasma glucose level, Peroxidase method and Glucose Oxidase it was found that ethanolic extract showed a significant decrease in blood glucose level. However capsule and liquid extract formulations are proprietary herbal blends and are available in several strengths besides this powder, teas are also available. Note: There is still a lot of research needed to be done on the uses of Mimosa pudica as medication. It have limited information regarding adverse reactions, Safety and efficacy in pregnancy and lactation is lacking so please consult the Dr. before consuming any such remedy or formulation. he extract of Mimosa pudica contains an alkaloid mimosine, that has antiproliferative and apoptotic effects,it can kill the filariform larva of Strongyloides stercoralis in less than one hour.